Thoroughly revised and expanded, this second edition of the popular reference addresses the many important advances that have taken place in the field since the publication of the first edition and includes new chapters on Multiband Filters, Tunable Filters and a chapter devoted to Practical Considerations and Examples. * A chapter devoted to real-world examples and exercises that allow readers to test and fine-tune their grasp of the material covered in various chapters, in effect it provides the roadmap to develop a software laboratory, to analyze, design, and perform system level tradeoffs including EM based tolerance and sensitivity analysis for microwave filters and multiplexers for practical applications. 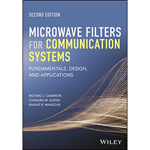 Microwave Filters for Communication Systems provides students and practitioners alike with a solid grounding in the theoretical underpinnings of practical microwave filter and its physical realization using state-of-the-art EM-based techniques.